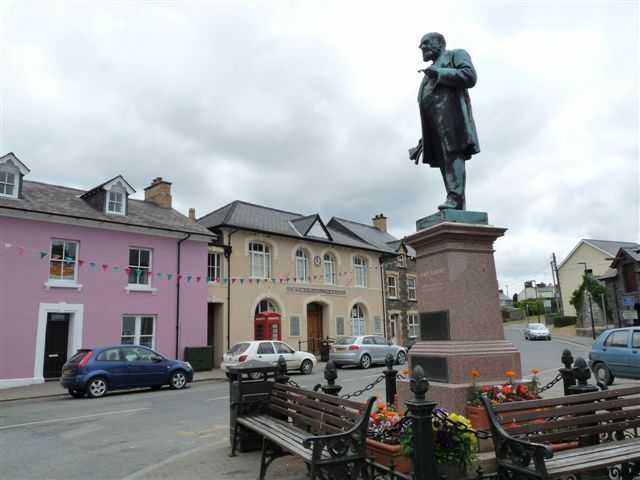 Location: Situated in the centre of the square in Tregaron. 1893 memorial statue by Albert Toft of London (1869-1949), cast by Moore of Thames Ditton. Memorial to Henry Richard (1812-88), native of Tregaron, Liberal MP for Merthyr, called 'the Member for Wales' and 'the apostle of Peace'. Bronze statue, 2.6 m (8' 6"), of Richard standing to speak, in everyday clothes, holding sheaf of papers headed 'PEACE' in one hand, spectacles in other. Granite 2.9 m (9' 6") pedestal with moulded cornice and plinth, inscribed 'Henry Richard A.S. Ganwyd Ebrill 3 1812 Bu Farw Awst 20 1888'. Also two affixed bronze plaques detailing Richard's achievements, one in Welsh, one in English. Surrounding low railing of 8 ornate iron posts with battered panelled sides and bulbous finials, scrolled low cast-iron panels and chains between posts. Listed as the focal point of the town, a statue of historical interest, and artistic merit, by one of the sculptors associated with the New Sculpture movement of 1880-1914. Situated on N side of the Square in Tregaron. Situated along the SE side of the Square in Tregaron. Situated in the centre of Tregaron, raised on a small hillock between the Bridge and the Square. Situated overlooking irregular square just W of Tregaron Bridge in town centre. Situated W of centre of Tregaron, on corner of Station Road and back lane to Bwlchgwynt Chapel. Stone cobbled pavement in front, cobbled yard behind. Situated on right side of Lampeter road out of Tregaron, just before Tregaron School. Situated at upper end of farmyard, facing down slope. Situated above W bank of Teifi, some 1.5 km SW of Tregaron, approached by drive running SE from A 485.